Behavior change communication (BCC) can improve infant and young child nutrition knowledge, practices, and health outcomes. However, few studies have examined whether the improved knowledge persists after BCC activities end. 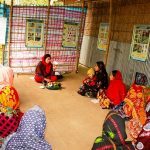 The new paper assesses the effect of nutrition sensitive social protection interventions on IYCN knowledge in rural Bangladesh, both during and after intervention activities.